Universal Records always has these great warehouse sales every few months. That's why I never fail to go to each of their super sales. 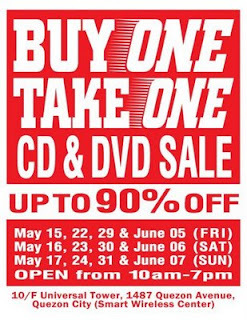 This time, it's a buy one take one CD & DVD Sale. They have wide selections to choose from. Looking for those expensive CDs you never got to buy cause you couldn't afford them ? Well now's your chance to complete your collection ! For prices as low as P40. and up you can get 2 CDs ! There are lots of genres to choose from, jazz, pop, rock, opm, instrumental, disco, classic, standard.. you name it, they have it. There are also lots of movie and video titles to choose from. Even boxed sets of popular TV series' like Monk and Las Vegas are available at discounted prices. I was there on its first day and there were already lots of people buying CDS in the bulk. Everybody had a box as their shopping cart and slowly each customer filled their boxes up with CDs to buy. I bought 10 CDs for a total of P260. I was also surprised to see cassette tapes being sold for two pesos each ! That's even cheaper than a blank tape ! The sale will be on every Fridays, Saturdays and Sundays from now till June 7. So that's May 15,16,17, then 22,23,24, followed by 29,30,31 and on June 5, 6 and 7. The sale is at the 10th floor of Universal Tower, 1487 Quezon Avenue, Quezon City. The building is also where the Smart Wireless Center is. It's almost across Crossings Department Store. I'll definitely be going back again to check out the other titles. Hurry and buy a ton of CDs at cheap prices !